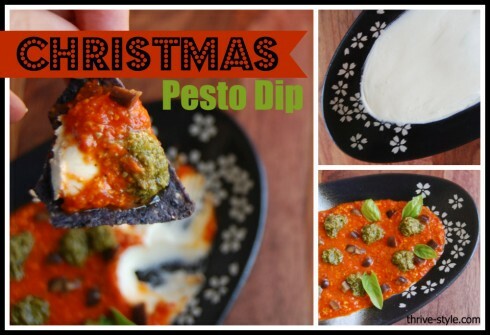 Amazing and Easy Holiday Pesto Dip! My Mom makes an amazing dip that has layers of cream cheese, pesto, roasted red peppers, and olives… so I thought I’d use the same idea and make up my own version that looks a little more bright and Christmas-y. This was really a no-fail recipe trial because cream cheese and pesto with roasted red peppers can’t actually taste bad! The real question was whether or not it would look nice and pretty. I think it does! If I had thought of it sooner, I would’ve piped the pesto on top in swirls or waves. Directions: Spread the cream cheese evenly in the bottom of a dish. I used a small shallow dish (I halved the recipe), but I think a pie dish or something similar to that size would work best for the full recipe. Pour some of the red pesto on top and spread evenly till the cream cheese is fully covered (add more as needed—it’s better to start with not enough and add more than to start with more than you need and try to scoop it out!). Put dollops of green pesto on top, or put the pesto in a plastic bag and cut the corner off so you can pipe it on in whatever design you want. Sprinkle black olive pieces on top and garnish with basil leaves. Serve with any type of chips or crackers. I promise that if you love pesto, you will love this! Previous post: 9 Things Essential to Surviving Your First Trimester! Next post: Delicious Red Macaroni and Cheese – Just 3 Ingredients!